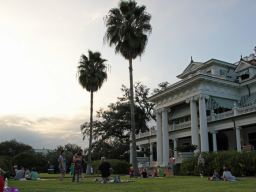 The stately McFaddin-Ward House was built in 1906 in the Beaux-Arts Colonial style. The building and its furnishings reflect the lifestyle of the prominent family who lived in the house for 75 years. All tours of the main house are docent-led. Reservations are strongly recommended. Children must be 8 years or older to tour the house. All ages are welcome on a self-guided tour of the Carriage House.